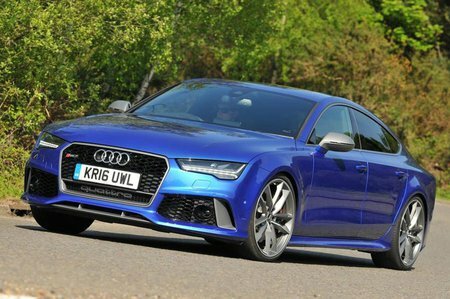 Audi RS7 Sportback Performance, Engine, Ride, Handling | What Car? 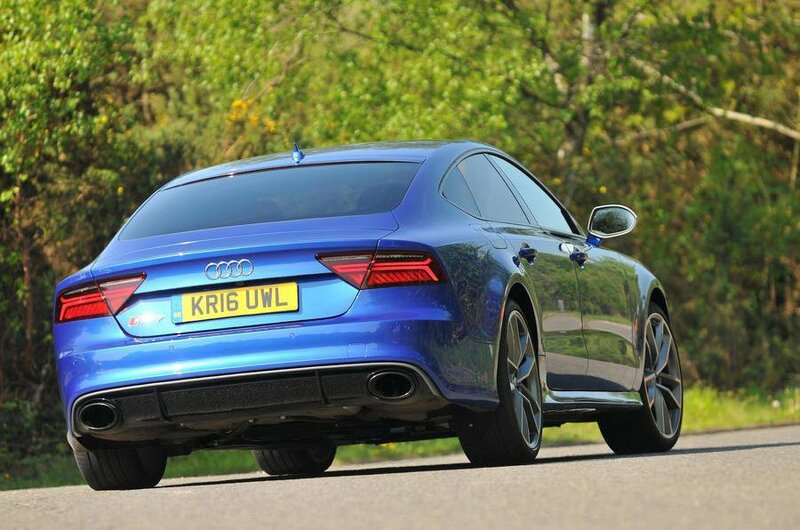 The RS7’s superb engine is certainly one of its strongest points. The twin-turbocharged 4.0-litre V8 petrol engine has 552bhp and 516lb ft of torque. Opt for the Performance pack and that becomes 605bhp and 553lb ft, and as if you hadn’t already guessed as much, either set of numbers offers enough brutal straight-line acceleration to pin you fully back in your seat. From a standstill the RS7 Sportback Performance can haul itself up to 62mph in just 3.7sec, bettering the standard model’s time by 0.2sec and beating its BMW, Mercedes and Porsche rivals. Both versions emit a gloriously deep burble from the exhaust, with added pops and bangs from the sports exhaust of the Performance model. Equally impressive is that when you’re not hell-bent on creating aural theatre from the engine and just want to gently cruise on the motorway, or waft through town in a hush, it will do just that as well. The RS7 comes with an eight-speed Tiptronic automatic gearbox, which is as versatile as the engine. Different drive modes – Comfort, Auto, Dynamic and Individual – alter the suspension, throttle response and gearshifts, but if no you switch to Comfort, the auto’s shifts are slick and smooth. Changing to Dynamic makes them sharper, but downshifts can be a tad jerkier as a consequence. Most will be happy enough to leave it in auto, but paddles behind the steering wheel enable you to cycle through the gears manually. It’s not all good news in the driving department, though. The suspension changes a lot depending on the drive mode selected. In Dynamic it stiffens it up to help control body roll and corner flatter, but the ride becomes so brittle that it’s uncomfortable on all but the smoothest tarmac. Comfort mode slackens it off to become more relaxed when cruising, leaving it surprisingly supple and comfortable for such a sporty model. While the straight line performance is unquestionably impressive, get to a corner and you’ll discover the main chink in the RS7’s armour: the handling. The steering is decently quick and light, but it offers precious little feedback on what the front wheels are doing. And while the RS7 generates stonking levels of grip through corners and its all-wheel drive quattro system delivers masses of surefooted traction on the way out, it’s more devastatingly effective than decidedly thrilling. That said, it is well insulated from wind and road noise at speed, something its BMW and Mercedes rivals can’t quite match.